In the UK something that is pretty close to our heart and soul food wise is the breakfast fry up. Smashed avocado (why is it smashed rather than mashed – does an avocado require an extra degree of violence?) may have taken a penicious foothold in the UK breakfast market and anything goes these days for brunch, but the fry up still reigns supreme as the UK classic “eat out” breakfast. The full English or Welsh (add laverbread) or Scottish (add tattie scones and Lorne sausage) or the Ulster fry (add soda/potato bread) are all variations of this British classic. The “full” [enter relevant State of the Union] breakfast is almost as synonymous with the British as roast beef and Yorkshire pudding. Apparently 25% of Brits on holiday cannot go without a breakfast fry up and thus eat one when on holiday abroad at some point. I suspect a large proportion of visitors to the UK also have one, during their stay, as it is pretty much obligatory on any hotel and B&B breakfast menus. 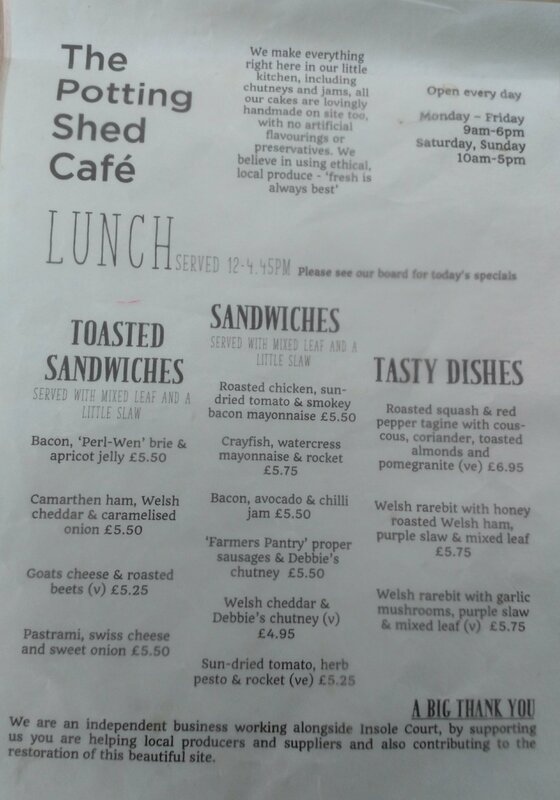 This brings me to the Potting Shed, a little cafe hidden away in a quiet part of Cardiff suburb of Llandaf (and believe me the exciting bit is pretty sleepy), which operates on an admirable community driven basis. 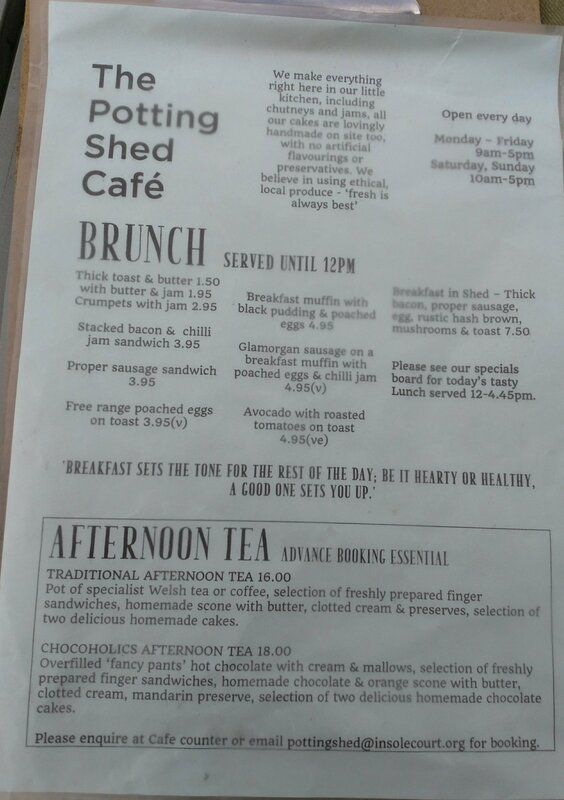 Situated in the grounds of the lovely Insole Court in Llandaf (a stone’s throw from where I live), the Potting Shed is a very welcome (and much used thankfully) addition to the area. 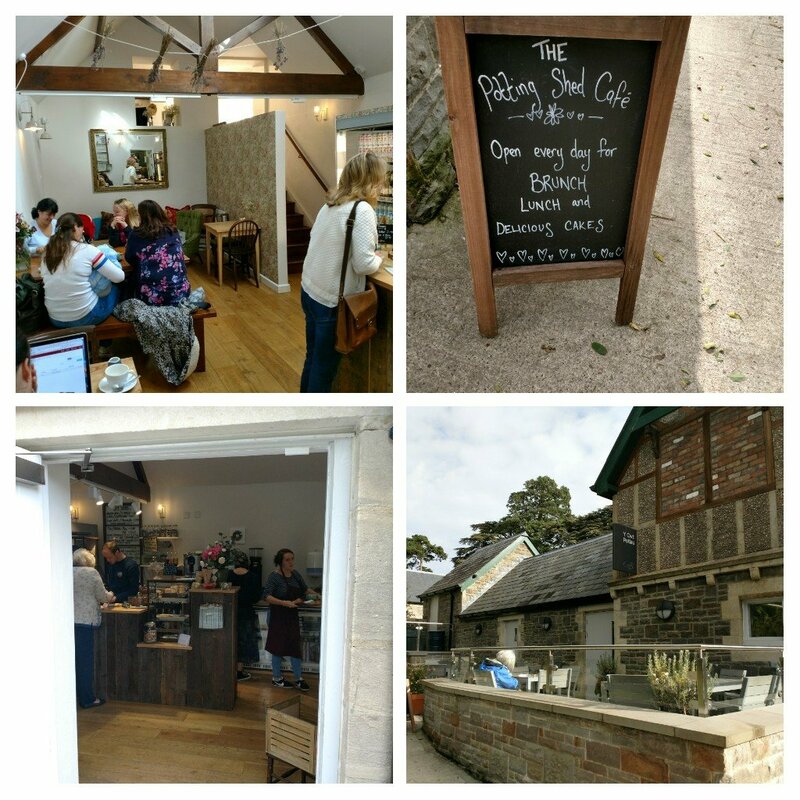 My advice is take a stroll around the grounds, have a wander inside the house (now open to the public and rather beautiful) and then pop into the Potting Shed for a bite to eat or coffee/hot chocolate. 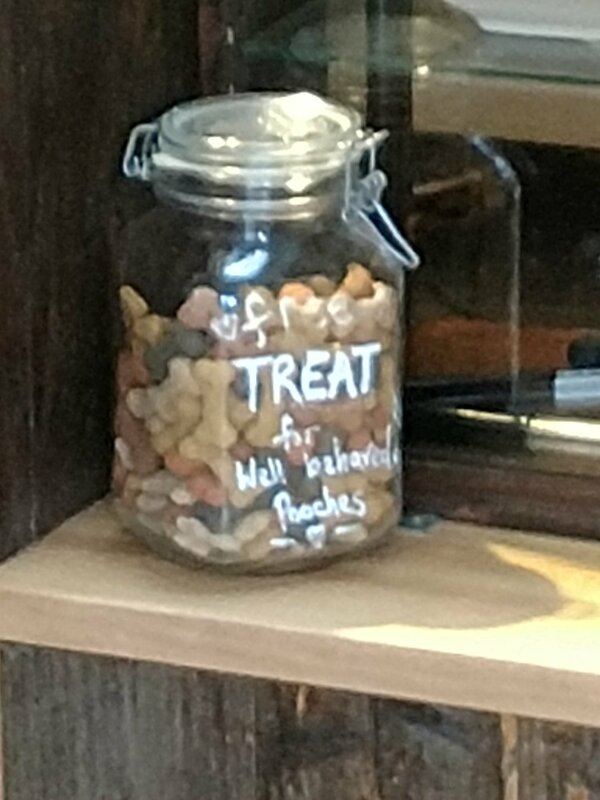 It is dog friendly to an extent (dogs allowed on the terrace outside which suits me with my two – lots of dog owners use the Court to walk their dogs – but not as I understand it inside) and well behaved ones get a treat (mine didn’t – so well behaved they didn’t notice them, good doggies). Cosy inside, with the outside terrace a real sun trap (with a lovely view of the house), it is a very pleasant place to have a drink (non alcoholic) and/or a bite to eat and wile away some time. I hate gardening with a passion (if there is a heaven and hell, when I slip this mortal coil, my punishment will I fear be an eternity of wandering aimlessly around a God forsaken garden centre – oh the horror) but there is no doubt that a well tended and varied garden is soothing to the soul and a great reliever of stress (so long as I am not the actual gardener). and an interesting “specials board. The focus is on local, even to the extent of using veggies from the community garden in the Court. Very little is bought in and the vast majority of stuff made in-house. This sort of thing really floats my boat. 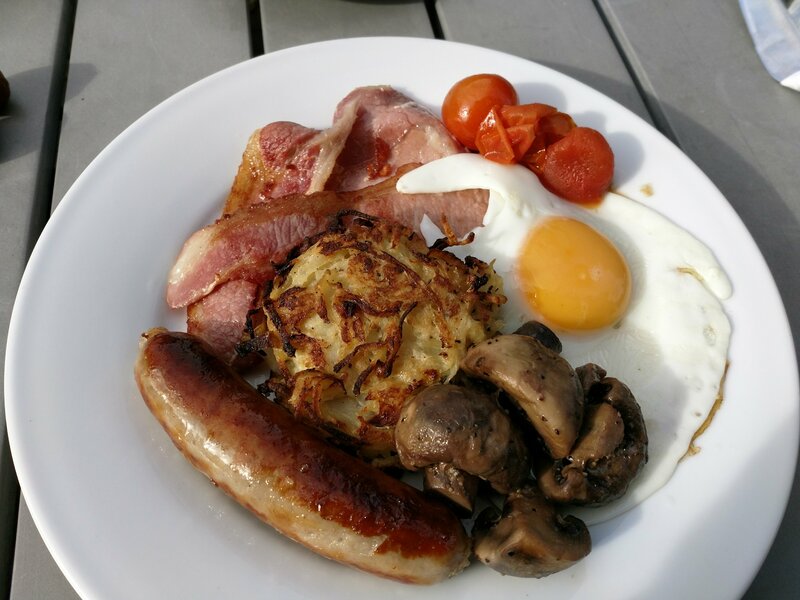 an admirably meaty sausage and a rather good hash brown (very tasty – I thought it more a rosti with a good onion to potato ratio). All in all an exemplary fry up, with the only thing missing, in my book, a slab of black pudding. At £7.50 it is not cheap by any means (still a quid less than the price of Dusty Knuckle’s seriously good Full Dusty), but (as with Dusty) I thought the price was fair enough based on the quality of ingredients used. Some brown sauce would have been nice mind (Inner City Pickle Mams brown sauce is what a fry up like this deserves -the Queen of brown sauces in my opinion). 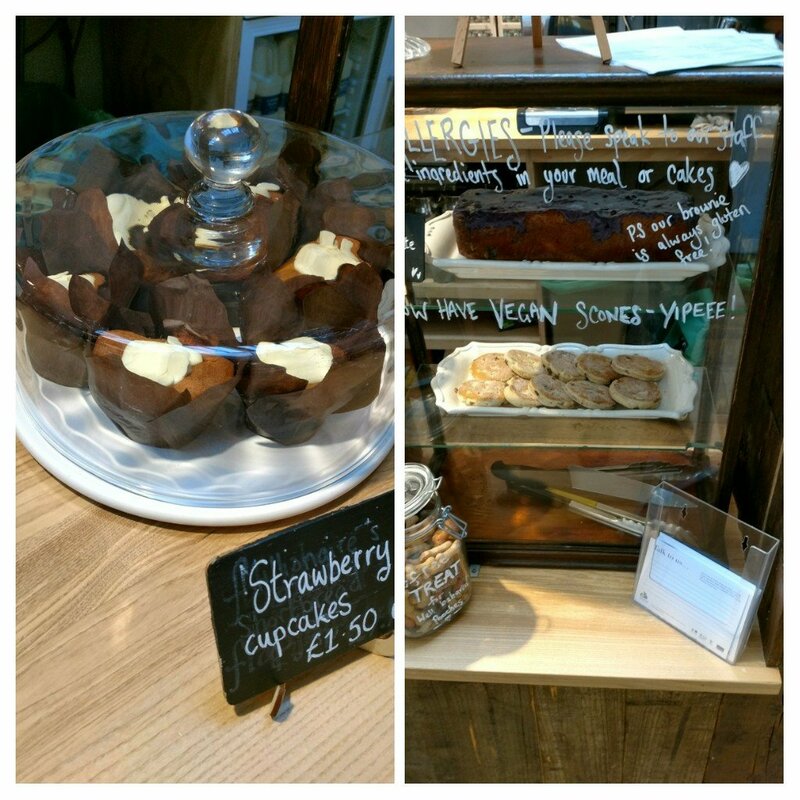 For those with a sweet tooth there are cakes (all made in house as I understand it). Great to see them catering for the gluten free crowd and for vegans, as wells as carnivores like me. and some seriously extravagant (I saw other tables get these) hot chocolate numbers. 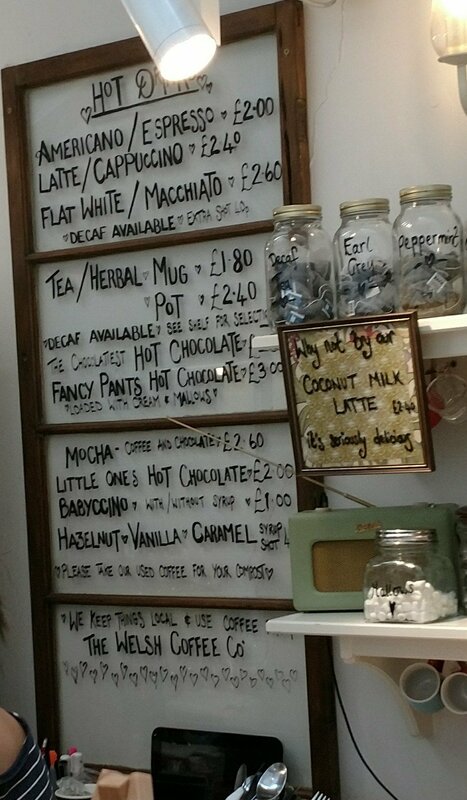 Mrs. SF and I both fancied a coffee, me a flat white (£2.60) and Mrs. SF a cappuccino (£2.40). Both very pleasant and sourced from the Welsh Coffee Company. 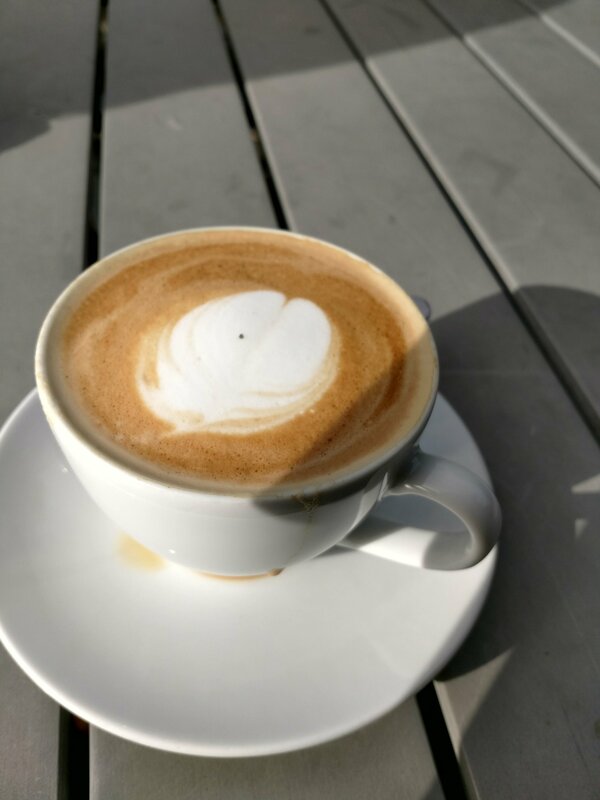 £20 for two full breakfasts and 2 coffees isn’t cheap, but it was top quality stuff and thus worth the money in my eyes. Would I go back? 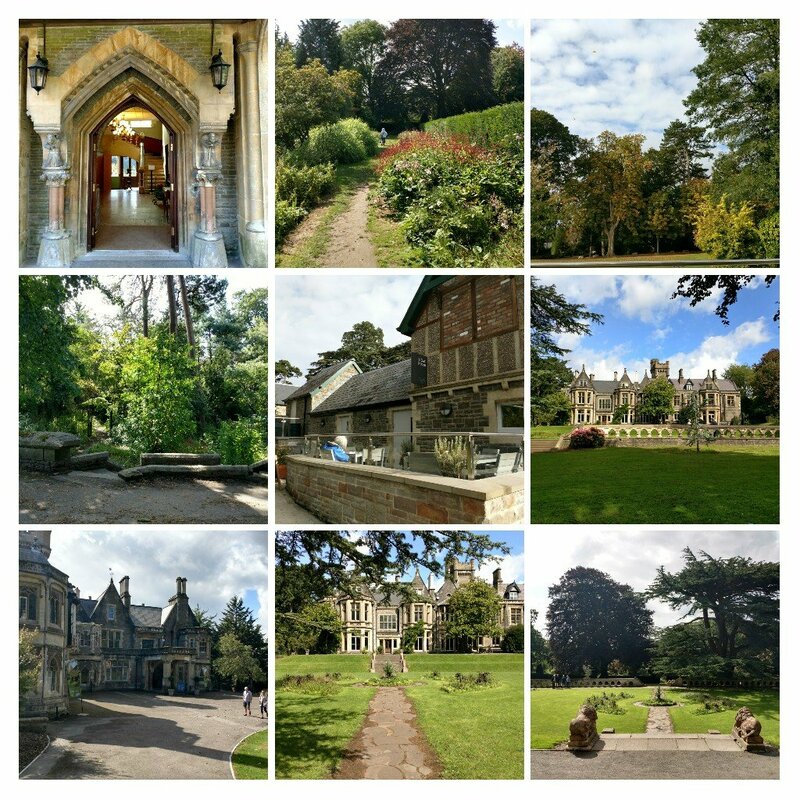 Absolutely – a hidden gem in leafy Llandaf (plenty of parking on site too for those who need to drive to get there and Waun-gron Park train station is a 5 – 10 min. walk away). If you’ve not been – go. 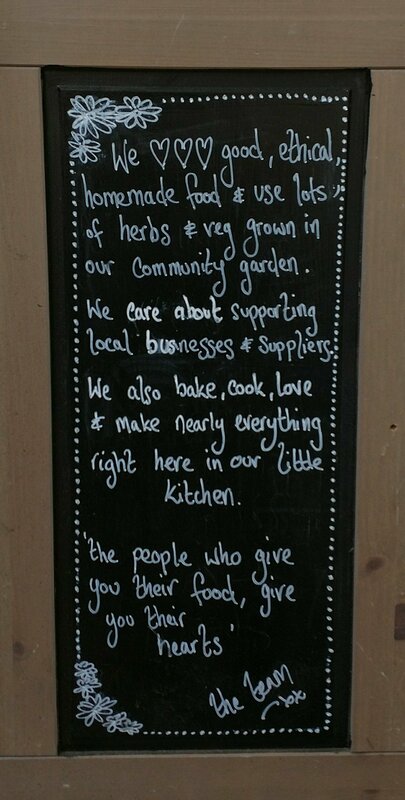 Wander the gardens, look around the house and definitely try the Potting Shed. 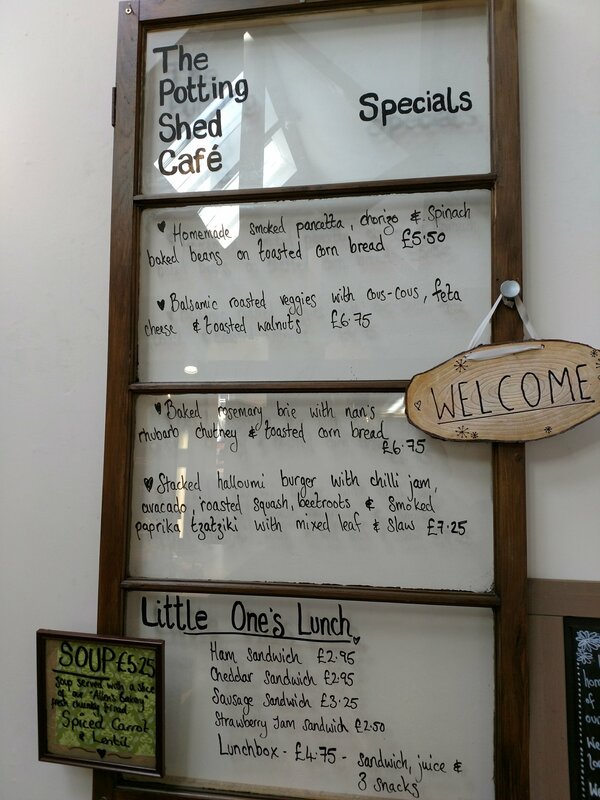 This entry was posted on Oct 8, 2017 by solicitingflavours in Bacon, Barbecue, BBQ, breakfast, Brunch, cafe, cake, Cardiff, Cardiff restaurant, charcuturie, cheese, coffee, dog friendly, Drink, Food, Gluten free, Greasy spoon, home cooking, Jams, Llandaff, Lunch, lunchtime, New restaurant Cardiff, Non alcoholic drink, pastry, restaurant review, review, salad, sausages, Take away, Takeaway, Tea, The Potting Shed, Uncategorized, vegan, Wales, Welsh food, welsh rarebit.